Wow. I opened this book prepared to be disappointed: I knew it had received literally thousands of perfect scores on Amazon and Goodreads, and was somehow convinced that it couldn’t actually be that good. But . . . it really is. Wow. Blood Song is the first instalment in Anthony Ryan’s Raven’s Shadow series (the second book, Tower Lord, is out later this year), and it’s simply a stunning start to what will undoubtedly be an amazing series. The world and its mythology are vividly established, the story is exciting and, most importantly, the characters are impeccably introduced and developed. The main group of characters, the Order brothers, are almost as awesome as Scott Lynch’s Gentleman Bastards, and the main character, Vaelin, is now firmly established in my Top 10 Favourite Fantasy Protagonists (somewhere between Kvothe and Jorg). One of the main things I loved about the story was how it was entirely focused on one POV: that of Vaelin, abandoned as a child at the gates of a monastery by his father. 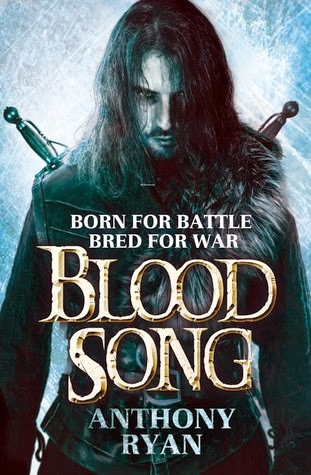 Blood Song follows Vaelin’s journey as he and his new-found ‘brothers’ are trained and initiated into the order of battle-priests, where they are forced to undergo rigorous and dangerous tests of survival and skill. The rivalries and camaraderie between the boys is continually a joy to read, and I loved watching them develop as a group throughout years of training, during which their loyalty is tested as they confront dark plots and assassination attempts against their Order, and each endure personal trials of their own. The characters develop brilliantly, the battles are fantastically plotted and exciting, and the gradual reveal of the underlying plot is spectacular. The main story itself is framed by another narrative, written in first person from the POV of the man to whom Vaelin is narrating his story. This reminded me very strongly of Patrick Rothfuss’ Kingkiller Chronicles, which is by no means a bad thing: as with Rothfuss, the switches are infrequent enough to not be annoying, and serve to show us more about Vaelin while also teasing us with hints about things we have yet to learn about. The ending – which came around far too soon despite the book’s 728 pages – is a perfect balance of resolution and cliffhanger, and I can’t wait for the release of Tower Lord later this year. Ezekiel Blue’s father committed a crime, unleashing a deadly menace into steampowered Seattle. And his bereaved family has paid the price. Now, Ezekiel is determined to clear his father’s name, risking death and the undead in the attempt. Sixteen years ago, as the American Civil War dawned, gold brought hordes to the frozen Klondike. Fanatical in their greed, Russian prospectors commissioned Dr Leviticus Blue to create a great machine, to mine through Alaska’s ice. Thus the Incredible Bone-Shaking Drill Engine was born. But the Boneshaker went awry, destroying downtown Seattle and unearthing a subterranean vein of blight gas, anyone who breathed its fumes turning into the living dead. The devastated city is now walled in to contain the blight. But unknown to Briar, his widowed mother, Ezekiel is going in. His quest will take him into a city teeming with ravenous undead, air pirates, criminal overlords, and heavily armed refugees. And only Briar can bring him out alive. Let me start by saying that this is most definitely not a zombie novel, although it is sometimes marketed as such. I picked this book up thinking “zombies? Awesome!”, and at first I was disappointed that they were such a minor aspect of the story. However, I quickly became enthralled in the plot, despite the disappointing dearth of zombie action. Priest does a great job of setting the scene, and paints a very vivid picture of the misery of day-to-day life outside the walls of Blighted Seattle. The scenes within the walled city itself, especially those on the streets, are brilliantly eerie and atmospheric, and the fact that we see it all through the restrictions of the characters’ gas mask (with limited peripheral vision and the echoing of their own breathing distorting their hearing) makes it very, very creepy. The highlight of the first half of the novel is really the tension that comes from entering the unknown, and I must admit reading these scenes made me quite jumpy. The rest of the novel is much more action-focused. We meet several other characters (some more nefarious than others) who scrape a living in the walled city, and the pace picks up quite a lot towards the end, with a three-way underground war and the big reveal of a dirty family secret. 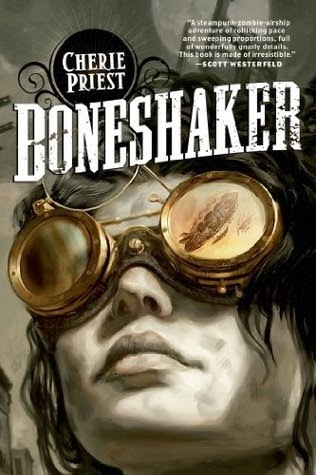 I wouldn’t say that the actual ending was brilliant, and the big ‘secret’ isn’t exactly hard to figure out, but I did find myself keen to read more of the series, particularly as the steampunk elements are a lot of fun and the scene-setting is so strong. The characters are fairly strong too, particularly the main character of Briar: she’s easy to both admire and feel sorry for (probably because she rarely feels sorry for herself): she’s a strong female character, but she’s also a realistic one, kept alive as much through the help of others as well as her own practicality, and driven only by her desire to protect her son (who, I must say, I didn’t have a lot of sympathy for). One of the downsides was, I felt, the lack of explanation about the Blight. Despite the eerie atmosphere created by the mystery of it and the fear of what to expect, I had hoped to learn much more about the undead, about the Blight and where it came from, but we never actually get any real answers on this front, which feels a little disappointing and unsatisfactory. I’d love to see further novels in the Clockwork Century series return to Seattle and stop the Blight once and for all. Until then, I’ll definitely continue with the rest of the series: I’m a big fan of Priest’s writing style, scene setting and suspense building, and look forward to reading more.